We’ve often shared the statistic reported by many organizations and government agencies that some 50% of those suffering with depression remain silent about their struggles, and so it’s no wonder that suicide seems to be the only way out to some. If we don’t have the opportunity, courage or education to reach out – or to be there for those who do – we’ll never make a dent in the number of completed student suicides that occur each year. The stigma wins. To combat this, many organizations – ours included – are active in promoting open and honest dialogue about mental illness. Normalizing mental illness the way we’ve normalized physical illness is critical and can only be done through more education and peer-to-peer conversations, especially among our young adult population. Lack of conversation about mental illnesses increase the stigma and that pushes more students back into their silent suffering. There are many factors contributing to this stigma, including a lack of education among teens surrounding mental health. Too many still don’t realize what depression is, the factors that contribute to anxiety and depression, what the symptoms look like or how to respond to those who reach out when suffering. To help combat the stigma and lack of education, The Lucas Fiorella Friendship Bench has launched an online campaign designed to start peer-to-peer mental health conversations among students. The Lucas Fiorella Friendship Bench and the campaign are excited to announce the launch of the #YellowIsForHello conversation tool. Still in Beta, the online tool provides students a series of questions aimed at inspiring reflection and dialogue surrounding students’ experiences with and perceptions surrounding mental illness. 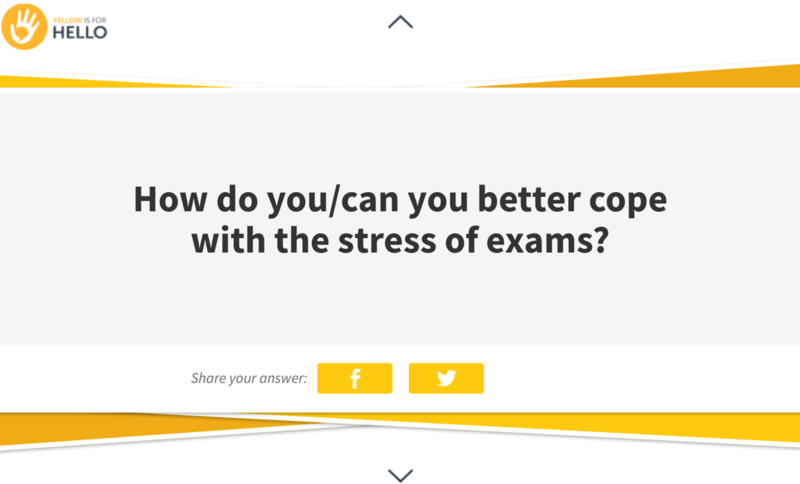 Further, it encourages peer-to-peer conversations and brainstorming on ways students can better manage the stress they’re facing. By opening up to each other, students will help break down the stigma and make it OK for others to be honest about their feelings. Our experiences have proven that the more peer-to-peer conversations that occur among students, the more likely students are to reach out for help. We’re launching this tool on January 16th, 2017, which is known as “Blue Monday” or “the most depressing day of the year.” While the origins of this day can be attributed to a marketing campaign by a UK-based travel agency, there’s certainly some evidence that points to “seasonal affective disorder” that affects many people at this time of the year. By shining a light on mental health and fostering peer-to-peer conversations about causes and prevention, we believe we can facilitate a change in focus from negative and reflective to positive and proactive. On January 16th, 2017 get a group of students together and have them open the #YellowMonday discussion cards on phones, tablets or laptops. A group of any size is good; however, we recommend groups of 4 – 6 students. We encourage schools to host a discussion where smaller groups can gather in one place at a specific time for greater impact. Plan a 30 to 45 time frame where students, in turn, scroll to a question and pose it to the group. Allow 10 minutes to discuss the question as a group, focused on being honest about experiences and sharing ways to build mental health resiliency. Where appropriate, use the social share features on the question card to share thoughts, more questions or lessons-learned from the discussion with peers. The more people that share in the conversation the more likely we’ll have an effect on all students! Sneak peek: See the Beta cards here. This will officially launch on Monday, January 16th, 2017 after we finish testing this week. That’s it! It’s that simple. Whether you do this as a small group or gather many groups in one place during the course of an hour, we encourage you all to take the time on what was formerly known as “Blue Monday” to help reduce mental health stigma through peer-to-peer dialogue and education. #YELLOWMONDAY IS NOT JUST FOR MONDAY! If this coming Monday is not a good day for your school, why not utilize this tool as part of your plans for the Bell Let’s Talk day on or leading up to January 23rd, 2017? We’re launching the first edition of this conversation starter on Blue Monday but it can be used at any time to help you encourage more peer-to-peer conversations!